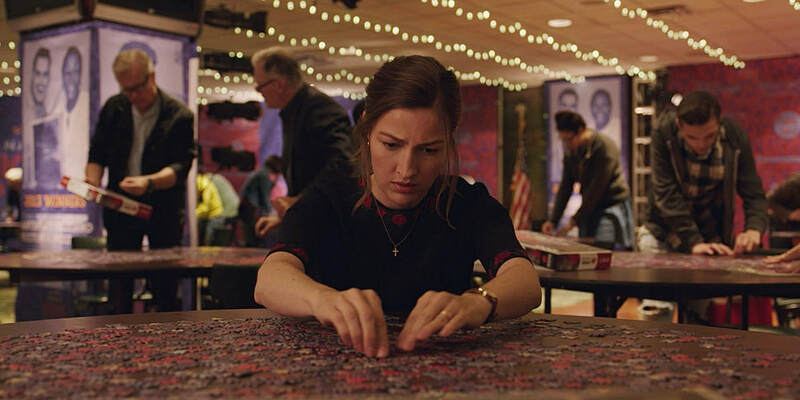 THE STORY - "Puzzle" is a closely observed portrait of Agnes, who has reached her early 40s without ever venturing far from home, family or the tight-knit immigrant community in which she was raised by her widowed father. That begins to change in a quietly dramatic fashion when Agnes receives a jigsaw puzzle as a birthday gift and experiences the heady thrill of not only doing something she enjoys, but being very, very good at it. THE GOOD - Subtle but very successful performances from Kelly Macdonald, Irrfan Khan, and David Denman. The film starts and ends with it’s best scenes, not to say the rest of the film suffers, but the directorial choices are smart and engrossing enough to create a very satisfying end product. THE BAD - It is a small story with reasonably low stakes that may feel insignificant or potentially boring to a certain audience. ​​​​​Agnes, played masterfully by Kelly Macdonald (“No Country for Old Men" & “Boardwalk Empire”), is a doting mother and wife that finds herself at the end of her child-rearing years, evaluating the next steps for her and her family. One of the best scenes of the film is the first scene. This is where we are introduced to Agnes and her caregiving ways, as she fusses about to prepare the perfect birthday party. In a brilliantly timed comedic twist, we learn that it is her own birthday celebration. This moment tells you exactly what you need to know about Agnes and her propensity to let her own needs take a back seat to those around her. As the film proceeds, we witness typical family dynamics and an ostensibly normal middle-class existence. When Agnes finally finds the time to sit down and complete a jigsaw puzzle which she receives as a birthday gift, she is thrust into a new adventure. She quickly realizes her gift for puzzling and is enamored with the satisfying feeling of putting in the last piece. Director Marc Turteltaub craftily captures the magic on her face as she rubs her hands across the now connected pieces with beaming satisfaction. She heads to the city to expand her collection and finds an individual seeking a partner for an upcoming competition. It is here she meets up with Robert, played by Irrfan Khan ("Slumdog Millionaire" & "Life Of Pi"), a wealthy, eccentric divorcee experiencing his own identity crisis. As she explores this hobby and unlikely friendship, it begins to take a toll on her domestic responsibilities. Her husband played very convincingly by David Denman (Best known as Bud from “The Office”), begins to resent this newfound distraction. In another series of meaningful scenes in the film, you watch the subtle way in which he layers levels of guilt onto her in an attempt to preserve his own fortress of well-being. Those are the moments that help you root for Agnes, albeit, never overtly. Your heart really does go out to all the characters of a story as they try and piece together (Pun completely intended), the best next steps. As the film begins with one of the best scenes in the film, it also manages to end on an amazingly potent and impactful note that wraps this film up as one of my favorites watches of the year. The film is subtle, full of humanistic moments, and relatable experiences that are just nuanced enough to keep things interesting. I suppose one could say that not much happens in the film, but that is part of the beauty of its message. It is authentic enough that most audience members, will see themselves or someone they know and love in the character of Agnes. There is something very liberating about witnessing her journey of self-discovery on the smallest of scales, but with stakes that are more realistically applicable for a general audience. Kelly Macdonald is a perfect fit for this role. Although, Agnes is a woman of few words, particularly self-expression, the anguish, and frustration that she captures on her face and through her actions, tells this story. It is her slight change in demeanor as she presents herself with a newfound confidence, that makes this film a success. Irrfan Khan perfectly plays his scenes opposite her as someone who appears to be confident and knows what he is doing with his life but we slowly learn that he is hurting on the inside and desperate for a new connection. “Puzzle” is not a film that will light the world on fire because the message is quiet and specific to middle-class domesticity. However, it is timely in its message of empowerment, self-worth, and the potential pitfalls of the traditional patriarchy household. It carries important themes for men and women, both, as they re-evaluate the simple behaviors that could be alienating a loved one or damaging the longevity of a partnership. I found the film to be completely successful in what it wanted to achieve, propelled by strong performances that also happened to carry my personal favorite ending shot from the year so far.